54,720. That's how many minutes are left. For almost a year I've heard the church bells ring on the hour. 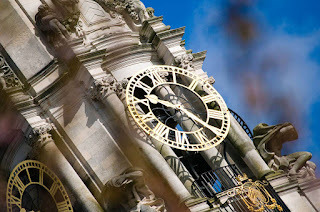 I've walked past the clock tower at Cardiff City Hall every day, it's face staring at me. The seconds have turned into minutes, minutes into hours, and eventually I find myself wondering where all the time has gone. So I slumber in the dream, waiting for the alarm clock to go off. It's just before dawn in the middle of August. The sun is sharp here, like a razor on the skin, then a cold breeze blows over my burning flesh. I can hear the door shutting behind me, and I can feel gravity pulling me into reality. It seems like only yesterday that we all began as strangers. Strangers who became friends, friends whose loyalty has made us family. The conversations, the tears, the screams, all are fading into memories. These experiences now depart each of us in these final moments of a year that has delivered us from the past. Soon our year here will take its final bow. Some of us will go home, returning to different cultures around the world. Some of us will move on to the next chapter of our lives... But, I'm not sure any of us will truly ever leave this place completely. As I walked down the cobbled streets of Cardiff today, the stones occasionally budging under my step, my shadow chasing me, I turned to a friend and we tried to put into context the events of the last eleven months. There are no words to describe it. This experience is solely owned by those who lived it. Should any one ever ask what happened this last year, we would reply simply, ambiguously, for there are no words to describe those forces which remain unseen and that have affected our lives. The story of us is doomed to silence, for any attempt at disclosure would surely seem like madness to those who did not witness it. So we make the most of what's left. We console each other in our impending conclusion. Days turn into nights, and our tribe dwindles one by one, and those who remain seal the circle, holding tighter onto one another, until at last, the vacuum of the universe which delivered us here returns us to those places where we belong. There is no seeking asylum in fairy tales, no waiting for Superman, and some how though we're tormented by these realizations, we're also stronger for them. We're dangerous now. We're saving ourselves now. So we count the stars. We run to the finish. Our final montage begins, time slows, and the music plays. Yet this isn't the end, it's just the road home. In these fleeting moments, we stand on the edge of our fears, holding to one final resolution. We're letting go. Minute by minute, second by second, as friends slip from our grasp and that which defines us fades into what we become. This is the difference in our former characters. We willingly fall to turn fleeting moments into new beginnings. Not because we're certain it won't hurt when we hit the bottom of this abyss, but that we're now strong enough to get back up and start again. In the end, we won't remember the minutes, we'll remember the moments.